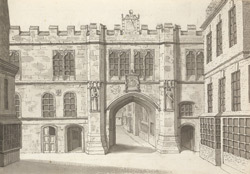 A view in ink of the stone bow, or arch, in High Street, Lincoln. This gatehouse dates from Henry VIII's reign. In a niche on the east side of the south front is a statue of the angel Gabriel; on the west, one of the Virgin Mary treading on a serpent. In the centre is the shield and arms of the City of Lincoln.